Eyebrow is an important part of your face. It provides a defined and accentuated look to your face. When your eyebrow is perfectly shaped with full and finer growth, you look more charming. All of us do not have perfectly shaped eyebrows. You can have perfectly shaped eyebrows only when you have thick eyebrows. Some do not possess thick eyebrows. There are home remedies that can help you have thicker eyebrows. Aloe vera pulp is also widely used for proper growth of the eyebrow. Take the pulp of aloe vera from its leaves. Apply this pulp on your eyebrow and wait for about 30 minutes. Wash off with water. This is an excellent remedy for curing the damage that is caused to your eyebrows due to over plucking of the brows. Applying this pulp regularly helps in the re-growth of eyebrows and also makes the skin near the eyebrow soft and shiny. Grate coconut and squeeze out its milk. Dip a cotton ball in this coconut milk and apply it over your eyebrow at night, before you go to bed. Leave it overnight so that the hair roots in the eyebrow area are well nourished. Applying it regularly is very beneficial for the re-growth of your eyebrow. Egg yolk is also good for the growth of eyebrow as it is rich in proteins and vitamins. Take and egg and separate the yolk from it. Beat the yolk well and then apply it over your eyebrow. Massage gently with your fingertips. Regular use of egg yolk helps in improving the volume of hair in the eyebrow. Fenugreek seeds are known as methi in Hindi. These seeds are very effective for improving the growth of eyebrows. Take some fenugreek seeds and soak them in water overnight. Next morning take out these seeds and grind them to get a paste. Apply this paste on your eyebrows in the morning, before you have your bath. You may also add some drops of almond oil to this paste. This will enhance its benefits. Applying this paste regularly on your eyebrow helps in nourishing the skin and the growth of eyebrow. Lemon is anther home remedy for eyebrow growth. Slice a lemon and massage your eyebrow with this slice. This can improve eyebrow growth. Take ¼th cup of coconut oil and add pieces of a lemon. Keep the mixture in a dark place overnight. Next day you can take it and apply it on your eyebrow. You can dip a cotton ball in the mixture and apply it on your eyebrow. After you apply this on your eyebrow, make sure that your skin does not come in contact with direct sunlight. This is a precautionary method to protect your skin from irritation. Milk and milk products are rich sources of protein and vitamins. So they are very beneficial for making your eyebrows thicker. Take a cotton ball and dip it in some milk. Rub this over your eyebrows at night before you go to bed. Milk helps in nourishing the roots of the hair of eyebrow. By applying milk in this way daily, you can increase the growth of hairs in the eyebrow. Onion juice is very effective for getting thicker eyebrow. This is because onion is loaded with sulfur. Sulfur is excellent for the hair growth in the eyebrow region. Grind onion and extract its juice. Dip a cotton ball in this juice and apply it over your eyebrow. Let it remain on your eyebrow for 10 to 15 minutes. Then you can wash it off with cold water. Apply this regularly and you are sure to get fuller eyebrow. Oil massage can also enhance the growth of your eyebrow. You can use coconut oil, castor oil, almond oil or olive oil for this purpose. Apply it over your eyebrow region and massage gently with your fingertips. This makes your eyebrow get thick and beautiful. Shoe flower is also known as hibiscus or China rose. This helps in making your eyebrow broad. All you have to do is to make a paste of this flower. Apply this paste on your eyebrow and let it remain for a few minutes. Then you can wash it off with water. This is an excellent home remedy for improving eyebrow growth. Apply Vaseline over your eyebrow region and near it for about two or three times a day. With regular application, this will improve the growth of eyebrow, so that you get thicker eyebrow. First of all, ensure that the diet you take-in is well balanced and contains all the nutrients needed for your body. It must be rich in vitamins C, B, H and E.
The second thing to remember is to consume enough water. Have at least 8 to 10 glasses of water daily. This helps in flushing out the harmful toxins from the body. Avoid over-plucking of your eyebrows as well as frequent threading of the eyebrows. This can cause damage to your eyebrow and prevent proper growth of the eyebrow. When you apply creams and lotions on your face, you apply them over your eyebrows as well. This can affect the proper growth of your eyebrows as they may contain harmful chemicals in them. You can use kajal or kohl on your eyebrows. These help in providing you dark eyebrows. 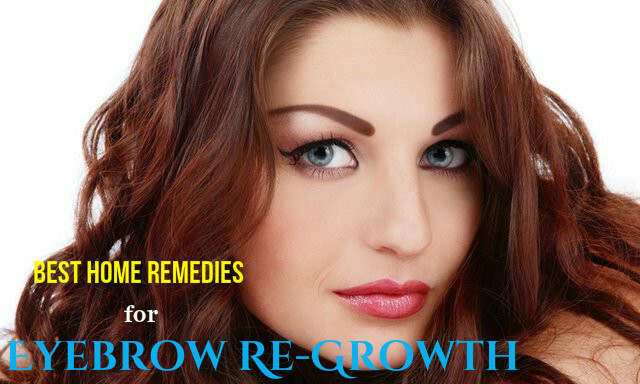 But the home remedies mentioned above helps in the re-growth of your eyebrow. So, try these home remedies and get thicker and more beautiful eyebrows.